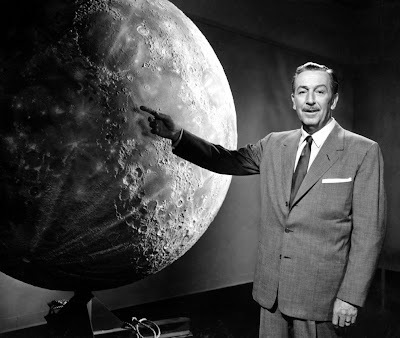 Years before Astronaut Neil Armstrong took "one small step for Man," Walt Disney was already sending mankind to the Moon and back aboard the TWA Moonliner Rocket at Disneyland. Amature space travelers gazing at the overhead scanner could view the lunar surface grow larger and more detailed as the rocket rumbled toward its destination. 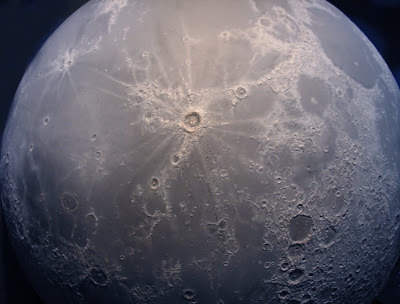 The moon seen in the Disneyland attraction was, naturally, an intensely accurate scale model sculpted by Pasadena artist Roger Hayward. 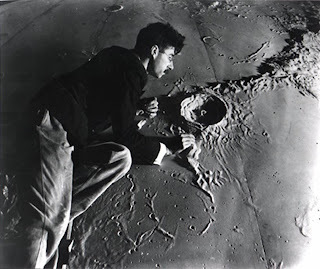 Hayward, who was also an accomplished scientific illustrator, had won international attention in 1934 when he constructed an enormous section of the moon's surface for the Griffith Observatory in Los Angeles. 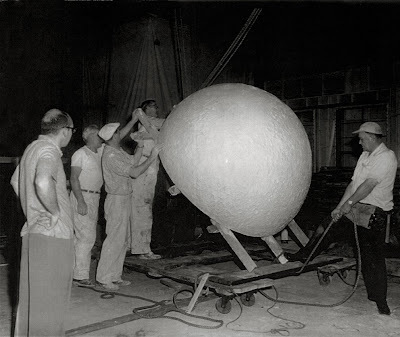 Roger Hayward, in 1934, sculpts an 80-foot diameter section of the Moon's surface. Soon Hayward was building smaller but complete moons for the Los Angeles Griffith and Chicago Adler Planetariums. 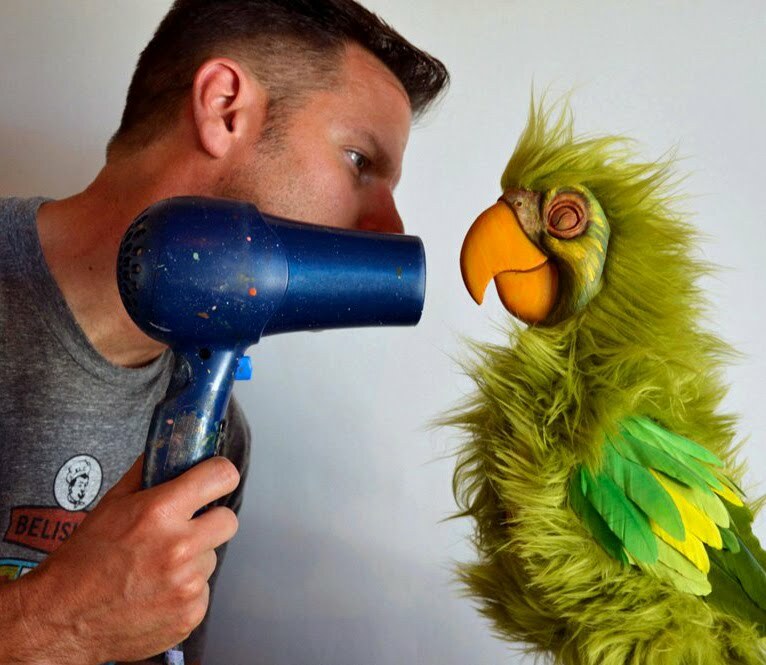 The Griffith model had been on display for nearly twenty years when Disney director Ward Kimball came along and made it a movie star in his Man in Space series for the weekly Disneyland TV program. The 6-foot moon was trucked down the hill to the Disney Studio staff shop, where a casting was made (from a huge mold about the size of a hot tub!) Reportedly in the process some of the surface details were altered, and Hayward himself was hired by Disney as a consultant to provide corrections. "Ah, see the moon, Moon that shines in June, Like a macaroon..."
Today Roger Hayward's Moon remains as impressive as ever, and I go out of my way to admire it each time I'm at the Griffith. The model was originally located in a special art deco-ish vestibule on the observatory's main floor, but was relocated in the recent renovation to a less-prominent spot downstairs. Strangely there is no credit given to Hayward at the display, which I think is a shame. 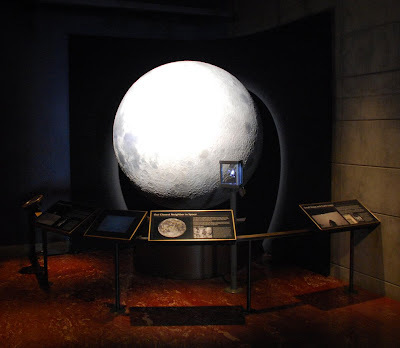 Apart from the detail and accuracy of mapping out the moon's real features, Hayward's model is an historic treasure of the planetarium itself, and a major attraction since the very beginning. As far as moon models go, this one is a star. Outstanding! Time to visit the Griffith again. Absolutely fascinating. I had long forgotten about this show. It makes me smile though, the instrumentation looks like it was borrowed from a pinball machine. Super history lesson-in-a-post, thanks Kevin! I gotta get to the observatory, haven't seen the renovation yet, now I got an excuse to go!. Interesting to see Robert Justman in the credits as Associate Producer. He went on to be a Producer for Star Trek and Star Trek: TNG. The 'Man and the Moon' clip is delightful, and Hayward's model looks superb! I'm sure that the series would not have been as great without it. Kevin, your blog is full of so much great information, it's a crime that it's free!! 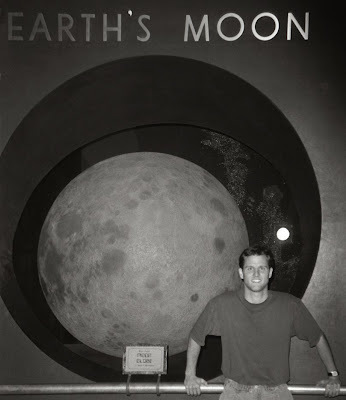 I love the Griffith Observatory, and in fact I always wondered if that model of the moon had been used in the Disney TV show. Wonderful photos too! Thanks so much. Hey Kevin - Roger Hayward was my great uncle. It is so bizarre to find out things I never knew about him, online. We do have a copy of his collaboration with Linus Pauling laying around; he made jewelry, and I have one of his tools sitting on my desk because it looks cool. 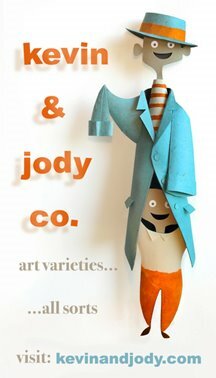 He made funny little wooden heads whose tongues stuck out when you pulled a lever. I never met him. He's WAY more interesting than me. The original Hayward Griffith Observatory moon model was a 38 foot section, not 80 feet. It was the idea of the famous cutaway artist, amateur telescope builder, and Hayward's Caltech colleague, Russell W. Porter. It was removed in the mid-1960's. Hayward built a 6 foot moon hemisphere for Adler planetarium. Disney had Hayward reproduce both of these models (borrowing the master concrete molds from the giant model from Griffith) for his studios to be used in the Trip to the Moon and "Tomorrowland" TV shows. The current Griffith Observatory globe is not by Roger Hayward, but was a commercial globe made in the late 1960's after Lunar Orbiter mapped the whole moon. We do have, in storage, Hayward 3-D models of Meteor Crater, Arizona, and Crater lake, Or. Hayward was involved with the first generation of exhibits at Griffith Observatory, including our Foucault pendulum. Thank you for posting this --- Hayward was my great uncle. I'm amazed by how much I can find out about him online thanks to people like you.